Hearing testing is a means of evaluating an individual's overall hearing function. The tests are used to determine if there is something wrong with the hearing (auditory) portion of the inner ear. They are often used as an initial screening to decide if more expensive tests like magnetic resonance imaging (MRI) are needed. Finally, hearing tests can be used to decide if a hearing aid might be helpful. Pure tone audiometry is the key hearing test used to identify hearing threshold levels of an individual, enabling determination of the degree, type and configuration of a hearing loss. It provides for the basis for diagnosis and management. It is a subjective, behavioural measurement of hearing threshold, as it relies on patient response to pure tone stimuli. 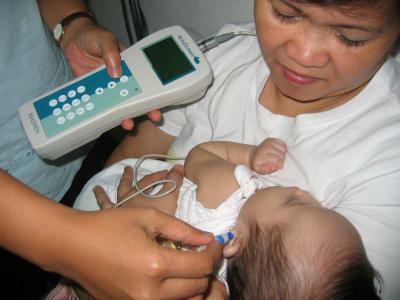 A screening test used in infants to observe their behavior in response to certain sounds. An essential part of the battery of comprehensive audiometric tests--evaluates speech reception, recognition, and understanding. Speech audiometry results and pure-tone thresholds help otologists determine the level of hearing dysfunction and select the appropriate hearing aids for individual patients. A test that uses an electrical machine to transmit sounds at different volumes and pitches into your child's ears. Your child usually wears some type of earphones. This test is modified slightly in the toddler age group and made into a game. The toddler is asked to do something with a toy (i.e., touch a toy, move a toy) every time the sound is heard. This test relies on the cooperation of the child, which may not always be given. A measure of the stiffness of the eardrum and thus evaluate middle ear function. This test can be helpful in detecting fluid in the middle ear, negative middle ear pressure, disruption of the ossicles, tympanic membrane perforation, and otosclerosis. The result of the test is recorded in a visual output, called a tympanogram. Used to provide a measure of tinnitus for reevaluation of symptoms before, during, and after therapy. A test that uses electrodes (wires) attached with adhesive to the baby's scalp. While the baby sleeps, clicking sounds are made through tiny earphones in the baby's ears. The test measures the brain's activity in response to the sounds. This test is painless and takes only a few minutes. This is a relatively new test used to assess hearing in newborns as well as being a method of determining whether the cochlea is functioning. With this test, a probe that contains both a tiny speaker and a tiny microphone is inserted into the ear canal. Quiet tones are sent from the speaker, which travel through the middle ear and stimulate the hairs in the cochlea. The hairs respond by generating their own minute sounds, which are detected by the microphone. If there is a hearing loss, the hairs in the cochlea do not generate these minute sounds. Earmold is a specially molded piece of lucite or vinyl material that is attached to a hearing aid to conduct sound into the ear. A custom fit device that attaches to a behind-the-ear hearing aid to deliver sound from the aid to the ear. Today, there have been 7 visitors (62 hits) on this page!